Cooking always tastes better when you start with fresh ingrediants. Below are some of the recipes that you can try with Ber-Gust Farms Produce! Also, check out the blog and the facebook page for more recipes to try. We also like hearing about what recipes others use Ber Gust Farms produce with, so feel free to share your favorite. An easy to make cookie that's a tasty way to use up butternut squash. You could use some fresh cooked pumpking instead of squash. 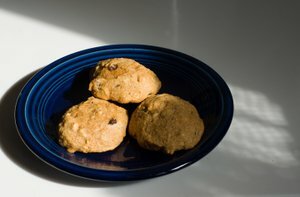 They're very cake-like in texture and the addition of whole wheat flour makes them a healthier alternative to most other cookies. In a large mixing bowl, cream butter and sugars until fluffy. Sift together the flour, baking soda, baking powder, and spices; add to moist mixture, stirring until well blended. Stir in raisins and nuts, if wanted. Spoon onto cookie sheets spacing cookies 2 inches apart. Bake for 10 to 12 minutes in the preheated oven, until edges are golden. Gently press tofu between several layers of paper towels to remove excess water; set aside. Combine cauliflower and tofu in a large bowl. Pour onion mixture into bowl and coat with cooking spray; mix with a spoon to thoroughly coat. Spread mixture onto a baking sheet in an even layer. Roast, stirring 3 times, until cauliflower and tofu are golden brown and smell very toasty, about 1 hour. Serve over rice. The pesto can be served over pasta, on bread, in omlets, brushed onto meats before grilling....the possibilities are limitless. 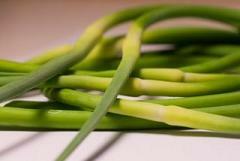 Chop 4-7 scapes and place in food processor or blender. Add 1 cup grated asiago or parmesan cheese, a 1/4 tsp salt, and 1 cup olive oil. Blend until smooth. If needed, add water, a tablespoon at a time, to reach the desired consitency. Store in the refrigerator in an air tight jar. This baked version served with whole wheat pasta is a healthy alternative to the usual fried preparation. Use seasoned tomato sauce instead of pre-made spaghetti sauce which can often contain oil and added sugar. Or even better - try making your own sauce! 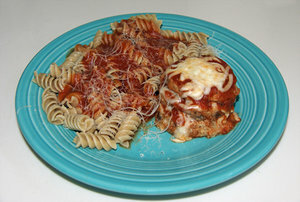 Place a layer of eggplant on bottom of prepared baking dish, then add 1/3 c. of tomato sauce and 1/3 of mozzarella cheese. Repeat with 2 more layers in same order. Bake until cheese is melted and sauce is bubbling, about 10 minutes more. Serve with pasta and remaining sauce. Copyright (c) 2014 Ber-Gust Farms LLC. All rights reserved.